I was hired by the Center for Global Policy Solutions to design and facilitate a social innovation lab program called the Health Equity Design Lab. Funded by the Robert Wood Johnson Foundation, the Health Equity Design Lab Health Equity Design (HED) Lab convenes thought leaders and community stakeholders to build consensus and incubate the best ideas that promote equity in key policy and program areas ripe for intervention or innovation. Its central focus is on changing policy, systems, and environments to affect the social determinants of health through a process that identifies best practices, recommendations and innovative solutions that can deployed by policymakers and the field at large to advance change, as well as help drive research that addresses gaps in existing knowledge. I worked with my team at Thicket Labs to create a data-driven workshop program that would convene public health professionals for two-day programs to explore the causes and consequences of gender-based health and pay inequities and their impacts on the health and economic wellbeing of women, children and families. The program included data collection through workshops and surveys, groups discussions and analysis, and the deveopment of shared impact forecasts and recommendations for policy solutions. 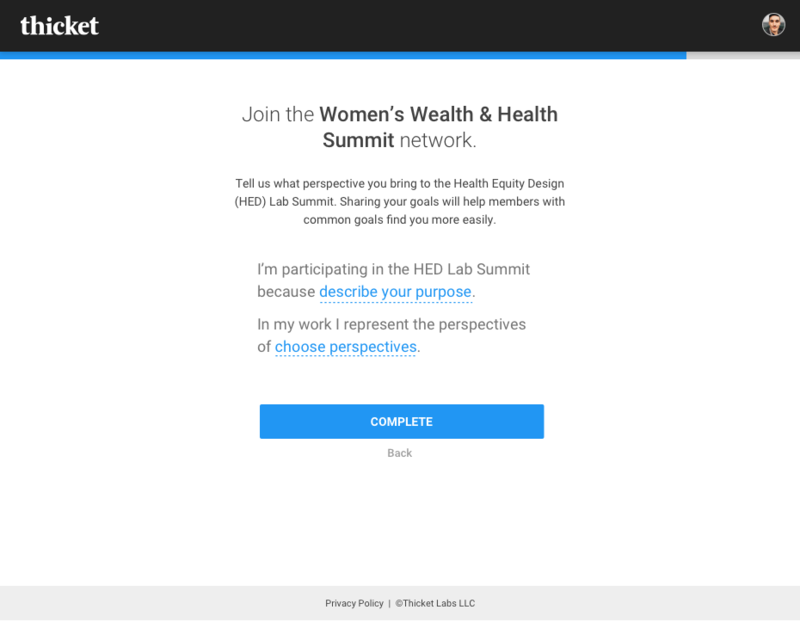 A refined policy agenda focused on addressing health and wealth inequities affecting women and families resulted from from a series of three design lab programs that each convened between 40 and 50 invited public health leaders. The policy agenda and accompanying recommendations was presented at the Women’s Wealth & Health Equity Summit, a two-day event bringing together over 150 experts, practitioners, and advocates from around the country. Through workshops and online surveys, the HED Lab program engaged over 250 experts, practitioners, and advocates from around the country in developing best practices, recommendations and innovative solutions to health equity challenges. Click here to read the first report from the HED Lab. Click here to see the presentations from the Health Equity Design Lab Strategy Session teams.